Top and bottom views of the encased tick. Around 100 million years ago, a tick ran into some bad luck. It had the misfortune of wandering onto a spider’s web, causing the proprietor to spring into action and wrap the interloping bug in a tomb made of silk. The situation then took a turn for the worse when the tick came into contact with tree sap, enveloping it even further. Today, this scene is immortalized in amber—and it’s the first known fossil to hold a tick entombed in spider’s silk. Prior to this discovery, scientists found traces of spider webs containing insects, and even a fossilized scene of a spider attacking a wasp. Fossils containing the preserved remnants of ticks are super rare (we know they tormented dinosaurs), so the discovery of a tick that just happens to be entombed in spider’s silk is an added bonus. 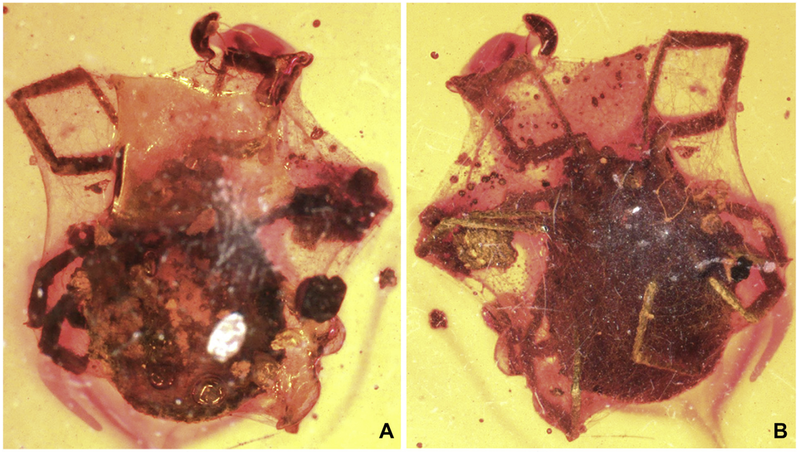 This amber fossil shows that ticks were captured by spiders back in the Cretaceous Period, marking “the first time that this specific interaction between ticks and spiders has been documented in the fossil record,” write the authors of the new study, which now appears in Cretaceous Research. Yep, that’s spider’s silk, alright. The amber fossil was found in northern Myanmar and it was provided to the Berlin Museum of Natural History by German collector Patrick Müller. A research team led by Jason Dunlop analyzed the unique specimen in detail, looking closely at the fine filaments enveloping the tick. The team was able to confirm the wrapping as spider silk, and not something like a fungal growth. This attack process has been termed immobilization wrapping and effectively renders the prey harmless before the spider bites it, and tests whether it is palatable. How the wrapped tick came to be trapped in amber remains a mystery. Perhaps a web on a tree stem was engulfed by resin? Alternatively if the spider chose not to eat the tick, and if the spider lived on a tree above a resin ooze, it could have dropped the discarded tick onto the resin where it became engulfed. Regardless, the tick’s misfortune has become scientists’ gain. Also, who cares about a stupid tick—they’re awful. And as this new study points out, spiders during the Cretaceous Period didn’t care very much for them, either.